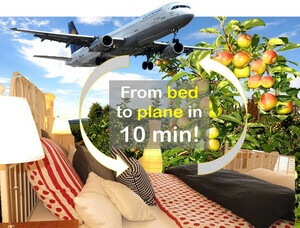 for 1, 2, 3 or 4 persons from 32 Euro per night / per person. 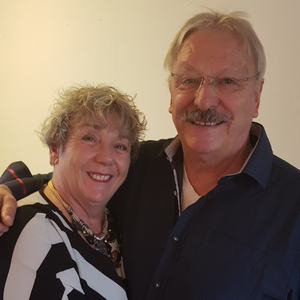 Hello, we are Dorothee and Volker and are living in Hattersheim on the Main for over 40 years–the city is located on the outskirts of Frankfurt and close to the recreation areas Taunus and Rheingau. We love to live here since it is centrally located close to Frankfurt on the Main but still surrounded by nature. It only takes a short car ride to reach Frankfurt city, Frankfurt International Airport or Frankfurt Trade Fair. 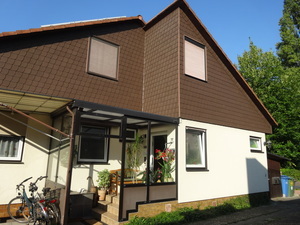 Hattersheim train station is in short walking distance within our house and provides good connections to the fast train and metro net of the Rhine Main area. We offer a newly renovated, fully equipped floor in our single family house with a separate entrance that can accommodate 1, 2, 3 or 4 persons. Here you’ll find 2 lovingly furnished bedrooms with lots of extras, a large bathroom with shower and WC (including hair dryer, shower gel, etc. ), a kitchenette (with fridge, coffee machine, etc. 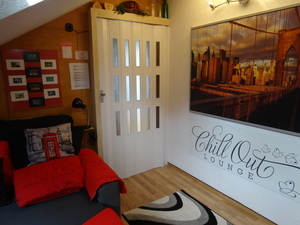 ), a cozy living room with a big couch, flat screen TV + radio and much more. 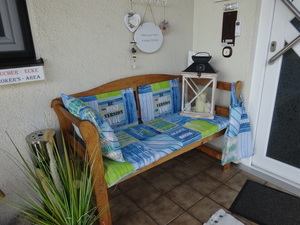 Outdoor: a balcony (12 sqm in size), parking space, bicycles for rent. 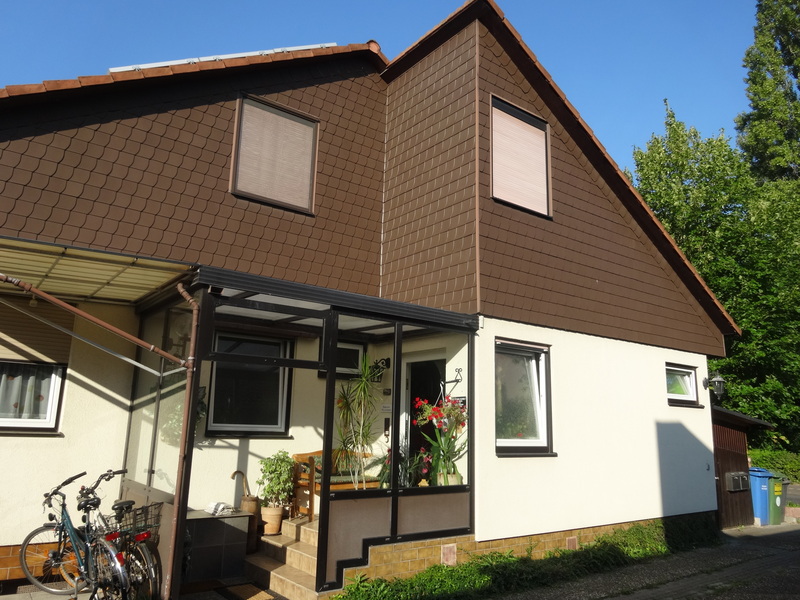 Indoor: temperature regulation through air conditioning and central heating, all windows with roller shutters… and a lot of comfort, coziness and space. We’ll do everything to ensure that you feel comfortable at our place. We respect your privacy, but are also happy to give you advice or assistance anytime you need it and to support your needs wherever we can. Our wish is that you feel AT HOME. You can find more references below. Hattersheim, on the outskirts of Frankfurt/Main, is conveniently located on the rail line between Frankfurt and Wiesbaden. 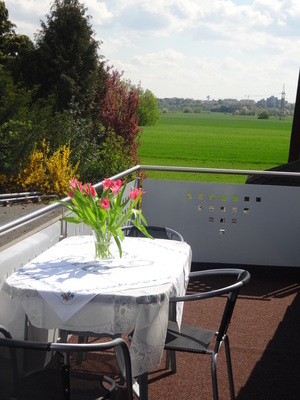 It is a small town with a charming historic town center and is surrounded by agricultural fields and greenbelts, which you can view from our balcony. You can access regional bicycle trails along streams and rivers directly from our neighborhood. 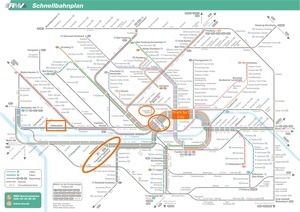 You really have very good transport connections to Frankfurt city, Frankfurt Trade Fair, Frankfurt International Airport (FRA) and Frankfurt Main Station. 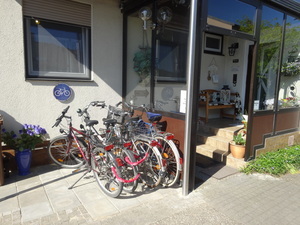 There are good shopping possibilities close by our house which can be conveniently reached by foot or bicycle. Shuttle service from/to the airport? Profit from our airport transport service: We are happy to offer you our shuttle service. 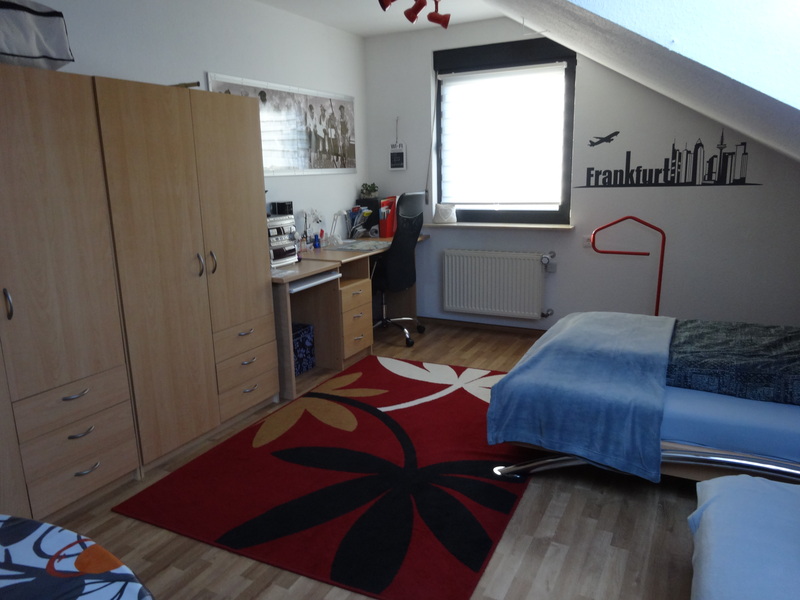 It is only a 10 minutes drive from our house to Frankfurt International Airport (FRA)! „Do it yourself“ … or if you wish we are happy to offer you a rich continental breakfast: it includes fresh buns, cold cuts, cheese, yoghurt, jam, Nutella, coffee/tea and more. Free internet access via WLAN. You are welcome to use the netbook we provide. 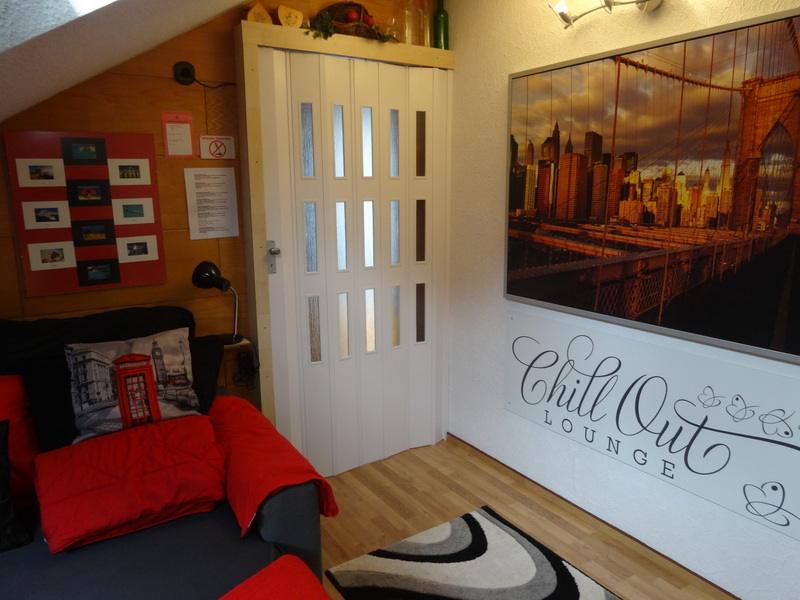 …with air conditioning, central heating and your private balcony. Cable TV (new flat screen TV), radio, CD-player. 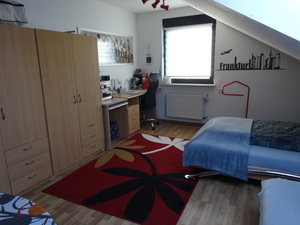 Two large, bright bedrooms (25 sqm), each may be used as a single or double room–with a big wardrobe and a desk. All windows can be darkened with roller shutters. We have maps, train time tables and other information material ready for you. Car parking space at the house. Bicycles to rent for free. We also offer you a laundry service. Separate living room (outside of the bedrooms) with a large and comfortable couch to watch TV. You enjoy a private large bathroom with window. It is equipped with shower, WC, double sink as well as a hair dryer, iron, shampoo/shower gel. Towels and bed linen are provided. For coffee breaks and small meals. 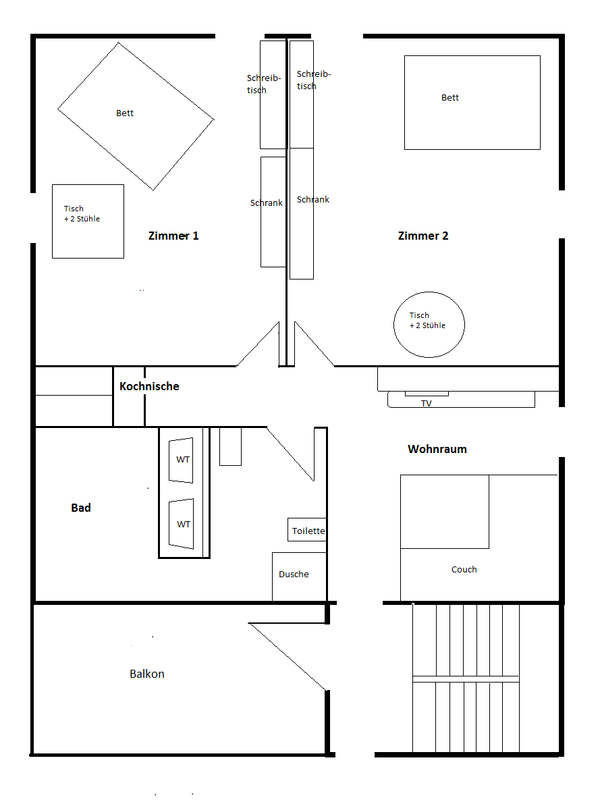 Equipped with coffee maker, kettle, fridge, microwave, dishes. Please note: no pets, non-smoking house. You may smoke at the entrance area of our house. As our guest you may rent one or both of the two bedrooms (for one person, for two, for three or for up to four persons). Irrespective of whether you book one bedroom or both bedrooms, the whole floor (approx. 80 sqm in size) will only be available to you. This guarantees your private use of bedroom, living room, bathroom, kitchenette as well as the new large balcony (12 sqm in size). We offer two large, bright bedrooms (both approx. 25 sqm in size), each fully equipped and lovely furnished. 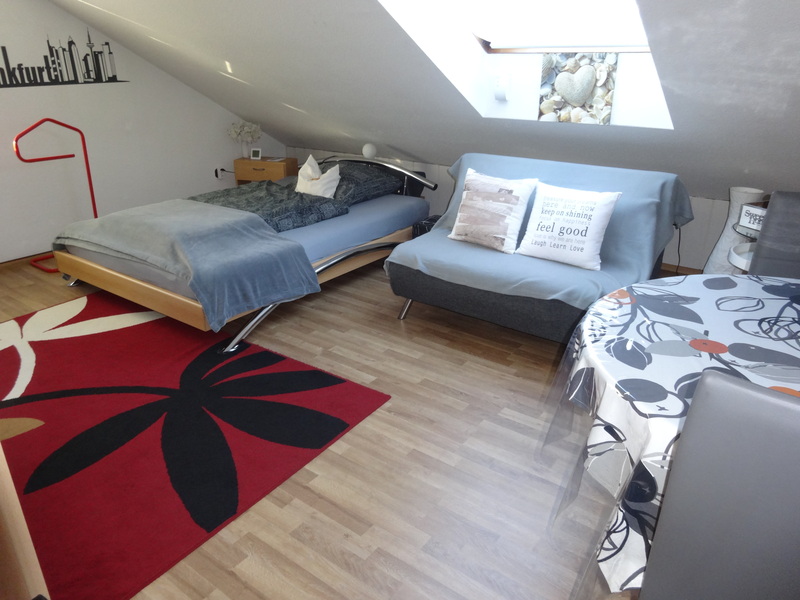 In both rooms you’ll sleep in a queen-size bed (140 x 200 cm) with a new high-quality mattress for one or two persons. 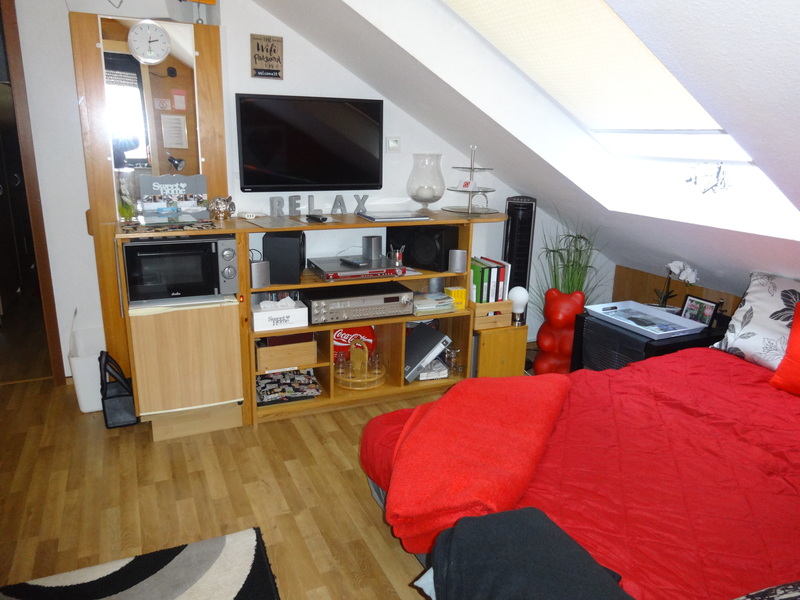 Each room has a large wardrobe, a desk, a table with chairs, a radio, a mirror and much more. All windows can be darkened with roller shutters. 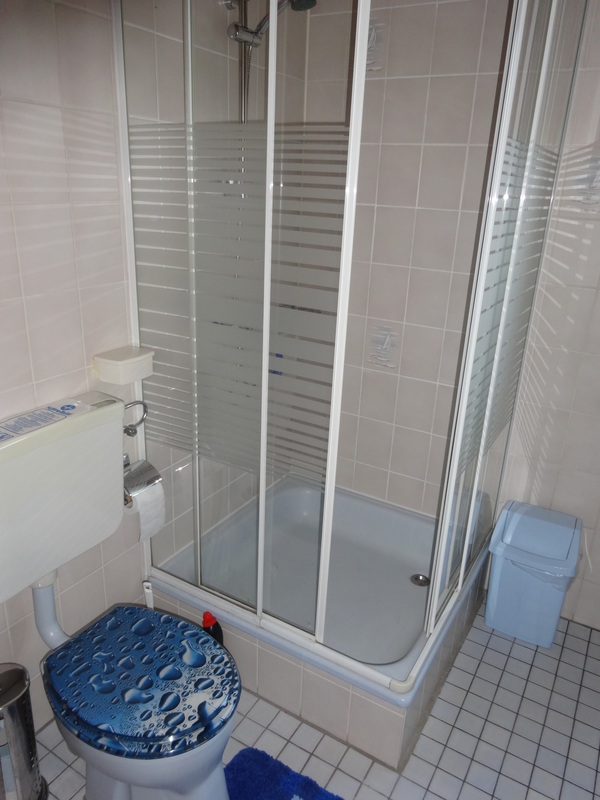 Your private bathroom (with window) is big and is equipped with a shower, a toilette/WC and a double sink with a large mirror. 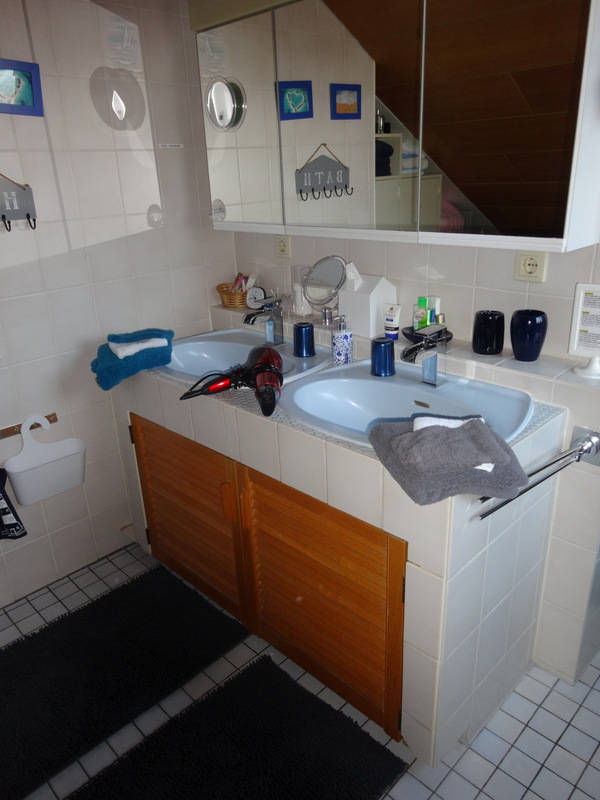 As our guest you may use for free: hair dryer, towels, soap, iron/ironing board, shampoo, shower gel and body lotion. If you need anything else: just ask us and we are happy to help. 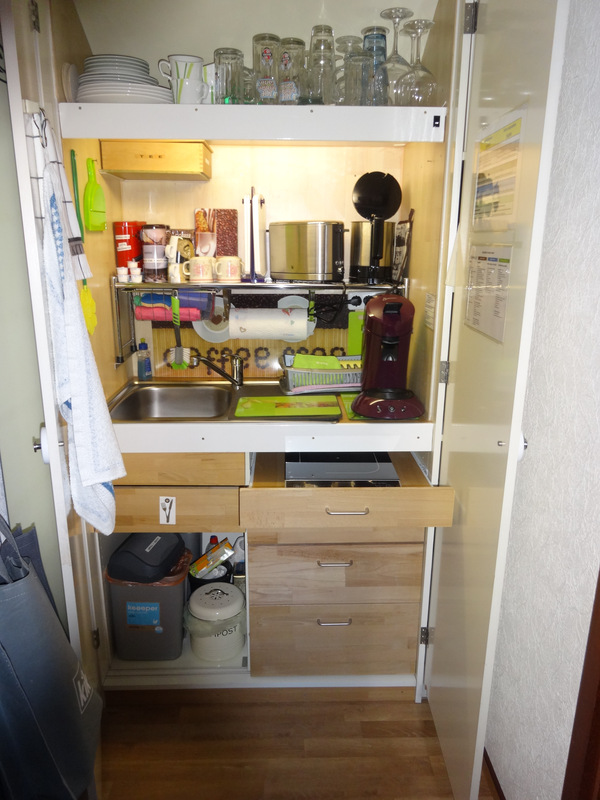 A small but fully equipped kitchenette offers you the possibility to make yourself coffee or tea as well as prepare small meals. It provides you with coffee maker, electric kettle, toaster as well as dishes, cutlery, glasses and much more. There is also a microwave and a little fridge for your use. Your additional separate living room has a large comfortable couch and is equipped with cable TV, radio and more. Here we invite you to relax, chill and enjoy your holiday or evening after a workday. We want you to feel comfortable at our place and offer our guests privacy through a fully separated area (approx. 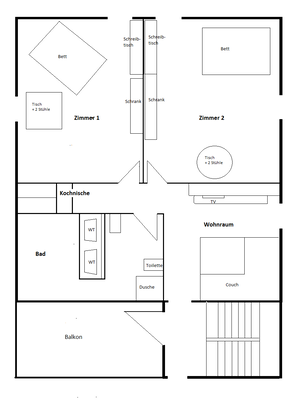 80 sqm in size) in our single family house: 2 bedrooms, living room, bathroom, cooking area and a new large private balcony. However, we are available for you at any time and are happy to give you advice or assistance whenever you need it. Our wish is that you feel AT HOME and enjoy the comfort of the apartment. ##Neighborhood Our town Hattersheim on the Main is centrally located (surrounded by fields, meadows and rivers) on the western outskirts of the Rhine-Main-metropolis Frankfurt on the Main, close to other major cities like Wiesbaden, Mainz on the Rhine, Darmstadt as well as the recreation areas of Taunus and Rheingau. Transport connection by car or public transport is ideal. The Hattersheim train station is within a short and easy walking distance from our house. It provides good connections to the train and metro network of the Rhine-Main area. 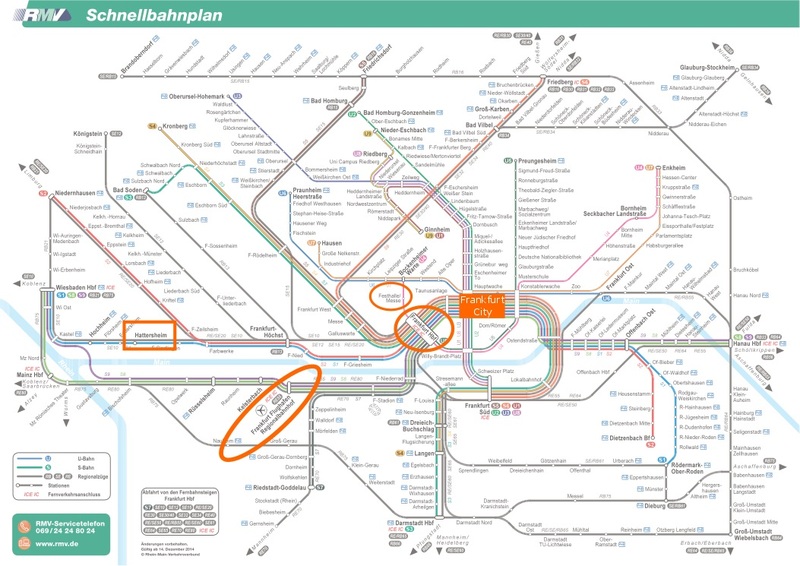 less than 25 minutes by subway S1 directly to the Frankfurt Trade Fair/ MESSE. The surroundings also invite you to take a walk along the Main river or to go on a leisurely bicycle tour along Main and Rhine. You enjoy the many regional specialties—for example the Hessian drink “Äppelwoi” with the local cheese “Handkäs”—as well as German traditional and international dishes in one of the many beer gardens, pubs and restaurants in the area. From 32.00 Euro per person per night, depending on the number of guests (1 to 4) and booking period. Check-in and check-out time can be arranged individually. We will gladly provide you with an offer on your request. We are happy to hear from you—just contact us by Email or telephone.